Comment: Ex-library copy with usual markings. Over 500,000 Amazon Sales - Buy with Confidence - Satisfaction Guaranteed! We Ship Daily! Excellent Customer Service & Return Policy. Ships from USA. The research described in this book is based on the premise that human analogy-making is an extension of our constant background process of perceiving―in other words, that analogy-making and the perception of sameness are two sides of the same coin. The research described in this book is based on the premise that human analogy-making is an extension of our constant background process of perceiving―in other words, that analogy-making and the perception of sameness are two sides of the same coin. At the heart of the author's theory and computer model of analogy-making is the idea that the building-up and the manipulation of representations are inseparable aspects of mental functioning, in contrast to traditional AI models of high-level cognitive processes, which have almost always depended on a clean separation. 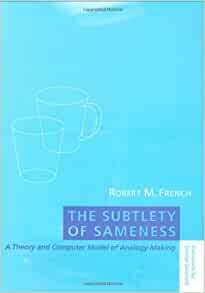 The research described in this book is based on the premise that human analogy-making is an extension of our constant background process of perceiving - in other words, that analogy-making and the perception of sameness are two sides of the same coin. At the heart of the author's theory and computer model of analogy-making is the idea that the building-up and the manipulation of representations are inseparable aspects of mental functioning, in contrast to traditional AI models of high-level cognitive processes, which have almost always depended on a clean separation. A computer program called Tabletop forms analogies in a microdomain consisting of everyday objects on a table set for a meal. The theory and the program rely on the idea that myriad stochastic choices made on the microlevel can add up to statistical robustness on a macrolevel. To illustrate this, French includes the results of thousands of runs of his program on several dozen interrelated analogy problems in the Tabletop microworld. Robert French is a faculty member of the LEAD cognitive psychology lab, part of the Biological Sciences Institute of the French National Scientific Research Center at the University of Burgundy. Since AI researchers are generally engineers, they historically did what engineers do: they broke up the mind in very clear-cut divisions, one for the perception of the things out there in the world, and another, symbolically, to do "abstract cogitation". For deep reasons, this was an invalid move, but only a few could see it. Robert French surely could, for his highly original tabletop project exhibits some of the best insights in Artificial Intelligence ever. AI is still so much pervaded with the wrong ideas that this book will need to take some time to make its definitive mark on the history of the field. If genuine understanding is ever to be built into a machine, understanding of the kind that Searle's gang will be forever denying, then it will come from an architecture similar to that proposed in this book. Then again, I could turn out to be wrong. But let us let History decide on this issue.